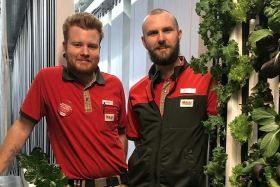 A hypermarket in Sweden has become the contry's first food retail store to produce hydroponically grown salad vegetables on site for sale to its own customers. ICA Maxi Högskolan, one of the ICA Gruppen cooperative's 1,300 stores in Sweden, said it had also launched its own line of produce to market the greens, which are grown beside the store in a shipping container that has been specially configured by vertical farming start-up Freight Farms. This follows hot on the heels of Swedish furniture retailer Ikea's announcement earlier this month that it was ready to serve up salad crops grown in containers outside its stores in Malmö and Helsingborg, firstly to staff but eventually to paying customers in its restaurants. "We're excited to be the first ICA Maxi store to implement an onsite farm," said Rikard Hillarp, owner of ICA Maxi Högskolan, which is located in Halmstad, between Gothenburg and Helsingborg. "By growing crops just steps from our shelves, we're able to offer our customers what are truly the freshest greens possible." Freight Farms' containerised farming technology will apparently allow the store to create and maintain optimal growing conditions that should yield produce year-round. What's more, it is said to use less than five gallons of water per day. Beyond its initial offering of butterhead lettuce, spinach, and herbs, the farm's integrated IoT data platform, Farmhand, is understood also to enable the production of non-native crops which would not otherwise be available in the region. "Freight Farms' technology is especially helpful in Sweden, where our short growing seasons can limit crop availability throughout the year and increase our reliance on imported produce," added Hillarp. "We're now able to shorten the distance food travels to get to our customers from 2,000km to just 30m." The potential for ICA and other grocery retail operators to reduce the distance travelled by fresh produce is regarded as hugely important, especially in terms of boosting nutritional content and cutting food waste. "Our team innovated the technology to empower individuals and businesses all over the world to decentralise the food system in meaningful ways specific to their local community or environment," commented Freight Farms CEO Brad McNamara. "We're thrilled to work with industry leaders like Rikard Hillarp and retailers like ICA Maxi, who together have the forward-thinking vision and reach to disrupt the grocery industry internationally." Freight Farms debuted the Leafy Green Machine – the first vertical hydroponic farm built inside an intermodal shipping container — back in 2012. It has since unveiled The Greenery, an updated model that reportedly boasts more growing space and "a totally new farming experience" within the same container-sized space. Its mission is to decentralise local production of fresh, healthy food and bring it to as many people as possible.